The Oratorio - Sito Ufficiale del Gonfalone! The Oratorio del Gonfalone is one of the most attractive buildings of the mid 16th century in Rome. In this venue "The Gonfalone's Friends" Association and the Roman Polyphonic Choir "Gastone Tosato" organized an elegant concert season, whose aim is to spread an art without boundaries. The Auditorium is adorned by an outstanding cycle of frescoes dedicated to the Passion of Christ. They were made by the main masters of Roman Mannerism. The cycle is divided into twelve episodes: it begins with entry into Jerusalem, continues with the Last Supper, the Oration in the Garden, the Capture of Christ, Christ before Caiaphas, the Flagellation, the Crowning with Thorns, the 'Ecce Homo, the Salita al Calvario, the Crucifixion and ends with the Resurrection. The scenes are surrounded by an architectural frame formed by spiral columns inspired by the vitinee columns of the ancient Basilica of San Pietro, which came, according to an ancient legend, from the Temple of Solomon. Above each episode are depicted a Prophet and a Sybil, subdivided by an architectural aedicule, which contains an allegorical figure painted in monochrome. The cycle was painted between 1569 and 1576, when cardinal Alessandro Farnese was the Oratorio's patron. His coat of arms is located on the wooden ceiling carved by Ambrogio Bonazzini, one of the greatest specialists of the time. It is an example of rare and valuable quality. The pictorial decoration of the environment is invaluable, fundamental in the history of the figurative arts and represents the first example of that kind of painting inspired by the ethical and aesthetic ideals of the Counter-Reformation, which continued to dominate Italian and European artistic culture for at least two centuries. It is probable that the task of the entire work was entrusted to Jacopo Bertoja, a Parma painter who arrived in Rome in 1568. The artist was called shortly after by Cardinal Farnese himself in Caprarola: so began the rotation of many artists such as Lucio Agresti, Raffeallino from Reggio, Federico Zuccari, Cesare Nebbia, Marcantonio dal Forno and Marco Pino. The origins of the Compagnia del Gonfalone date back to the 13th century. It was Pope Clement IV who, with "Breve" of 1267, officially recognized the Company. This, then constituted in the Confraternita, was closely connected with the work carried out by the great religious Orders, and especially those of Augustin and Franciscan, so much so that San Bonaventura da Bagnoregio was the inspiration of the institution to which the white dress with the red and white cross in blue field. In the course of the centuries the Confraternity was mainly active in the field of assistance where it gained great merits that in 1526 gave it the conferral of Rosa d'Oro by Clement VII and the authorization granted by Julius III from 1550 to free every year a prisoner taking care of the insertion in the society. This privilege was then increased by Gregory XIII who brought the number of prisoners to two to be restored to freedom, while at the same time raising the Brotherhood to the rank of Archconfraternity. Finally, another exceptional privilege was granted consisting in the possibility of obtaining the redemption of the Christian slaves of the Islamites, for which the members of the Brotherhood held for centuries, until the eighteenth century, official contacts with Constantinople and the Pasha of Algiers. The current Oratory, dedicated to the Apostles Peter and Paul, dates back to the sixteenth century and the Brotherhood settled there after having had, since the foundation, several offices whose history is still of complex reconstruction. The building, begun just before the middle of the century, was fully completed and decorated by 1580. The simple two-sided façade was built a few decades later on a project by the Ticinese Domenico Castelli. If the architectonic structure is remarkable, marked by austere sobriety and reminiscent, albeit in smaller dimensions, the noble vertical development of the most ancient Christian constructions; if rare and qualitatively valuable appears the wooden ceiling carved by one of the greatest specialists of the time, Ambrogio Bonazzini; it must be said that absolutely fundamental in the history of the figurative arts is the pictorial tradition that has been rightly judged by the specialists of the subject, as the first example, destined to throw its influence not only on the rest of Italy but also on Europe, that kind of painting inspired by the ethical and aesthetic ideals of the Counter-Reformation, which continued to dominate artistic culture for at least two centuries. If one considers schematically 16th century painting, this can be distinguished in two large phases corresponding, roughly, to the first and second halves. While the first half can be judged entirely or almost under the guise of Michelangelo (and in the first half of the century the Michelangelesque enterprises in the Sistine Chapel are located); the second half of the century is to be placed under the influence of the ideals matured in the very long and tormented Council of Trent. Of these ideals for decoration, the Oratorio del Gonfalone offers the most complete and paradigmatic example. Under the direction, at first, of the Parma Jacopo Zanguidi, called the Bertoja and, subsequently, of other distinguished exponents of the culture of the time was prepared, between the end of the seventh and the beginning of the eighth decade of the sixteenth century, a great cycle of the Passion of Christ that winds along the walls according to the rhythm of the ancient Sacred Representation. It should be remembered here, indeed, as was the Compagnia del Gonfalone, as well as organizing numerous processions for various moments of popular devotion, to hold, on the evening of Good Friday, starting in 1489, a magnificent representation of the Passion of Christ at the church della Pietà (now destroyed) to the Colosseum, a celebrated event in the Rome of the time and whose decoration the Oratory was a sort of perennial pictorial traction. The ideals of composure, nobility, profound and intimate feeling that, according to the Conciliar Fathers had to constitute the very essence of the artistic fact, are in fact formulated completely on the walls of the Oratory through a vast range of expressions; from the dramatic box depicting the Capture of Christ by the Emilian Marcantonio del Forno (one of the most ancient nocturnes in the history of painting) to the sad and solemn panel depicting the Fall of Christ by Livio Agresti forlì. In one of the frescoes, the Flagellation of Federico Zuccari, the memory of the theatrical action is explicit as the figures of Christ and his executioners are placed in a sort of stage above which a curtain opens. As in the Sistine Chapel of Michelangelo, also in the Oratory of the Gonfalone the events of the sacred history are accompanied by the presence of the Prophets and the Sibyls, the work of the same authors who performed in correspondence with the squares below. The story takes place from the bottom of the right wall (compared to those who enter) at the bottom of the left wall, following a path from right to left that corresponds to the natural movement of reading. The frescoes are framed by spiral columns inspired by the vitreous columns of St. Peter who were said to come from the Temple of Solomon. The first panel, completed in 1569, is the Entrance of Christ to Jerusalem by Bertoja, an artist protected by Cardinal Alessandro Farnese. The figure is dominated by the figures, also executed by the Bertoja, of the prophet Zaccaria and of the sibyl Eritrea. Follows the Last Supper by Livio Agresti da Forlì, dominated by an unrecognizable prophet and by the sibyl Samia, flanked by figurines, inserted in niches also not well decipherable. The next panel is the Oration in the Garden of a painter who signs himself as Domenico da Modena in an altarpiece executed in the Catalan Chapel in Santa Maria degli Angeli, a mysterious master, perhaps identifiable with the Modenese Domenico Carnevali who was the first restorer of the vault of the Sistine Chapel by Michelangelo, immediately after the death of Buonarroti. Following the Capture of Christ by the Emilian Marcantonio del Forno conceived as an evocative nocturne, surmounted by a prophet and a sibyl of Bertoja, unidentified, but flanked by two figurines, in niches, representing Judith and David. Following Christ before Caifa by Raffaellino Motta, called Raffaellino da Reggio, great protagonist of the painting of the time, prematurely disappeared. In this case too, the overlying prophet and the sibyl are not identifiable. The cycle proceeds on the counter-façade with the Flagellation of Federico Zuccari, dated 1573 and surmounted by a prophet and a sibyl, also by Zuccari, flanked by the allegorical figure of Charity. From the square of Zuccari changes the point of view of the frescoes, according to an idea probably elaborated by Marco Pino from Siena, now conceived according to the principle of the under up. Above the door is the large banner, in oil on canvas, depicting the Virgin who welcomes the members of the Arciconfraternita under her mantle and presents them to the SS. Trinity, the work of the little-known Cesare Renzi, accomplished by 1575. Above you can see the figure of King Solomon of the brilliant Matteo da Lecce. Following the Coronation of Spine of the Orvieto Cesare Nebbia, dominated by a prophet and a sibyl of Matteo da Lecce, flanked by two allegorical figures within the niches that could be interpreted as Justice and Martyrdom. The box on the next wall and the Ecce Homo by Cesare Nebbia, surmounted by an unidentified prophet and sibyl, also of the Mist. It follows the Ascent of Calvary by Livio Agresti, dominated by a prophet and a sibyl, of the Agresti himself, unidentified, flanked by allegorical figures of Pain and Compassion. The next box depicts the Crucifixion and is the most damaged. The author seems identifiable in the rare painter Guidonio Guelfi del Borgo, known for having worked in the Vatican together with Matteo da Lecce and for being a collaborator of Livio Agresti. The Deposition of the Cross is the work of a follower of Daniele da Volterra, perhaps identifiable as Giacomo Rocca, even if the work would seem to be performed by several hands. The overlying prophet is identifiable with Isaiah while the sibyl is not identified. The recognition of the allegorical figure in the niche is also uncertain, perhaps the Triumph of the Lion of Judah. The last panel is the Resurrection of Christ by Marco Pino, datable, probably, to 1572, among the masterpieces of the Oratory. It is surmounted by the prophet Jonah and the sibyl Cumea, flanked by the allegorical figures of the Faith and Divine Hope. The prophets and the sibyls on the triumphal arch are fragmentary and almost unattainable. The prophet Zechariah and the sibilla Deifica are identifiable. The plaque they display is taken from the Gospel of Luke and can be interpreted as the beginning of the Sacred Representation. The altarpiece of the high altar is reported, by documentary way, dating back to 1557 in Roviale Spagnolo, an artist active in Rome and in the south of Italy. 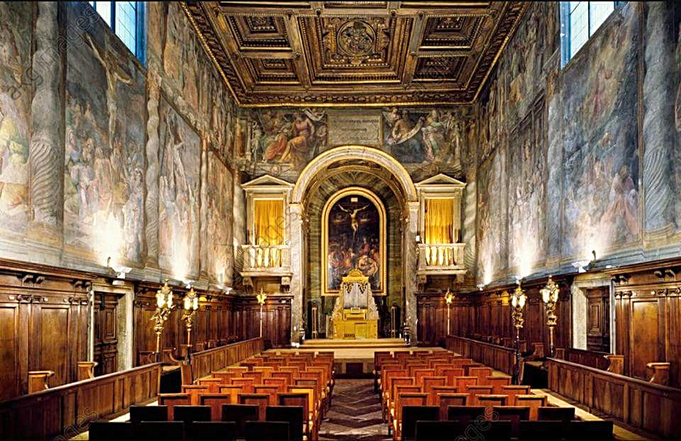 From October 1960 the Oratory, restored by the Superintendency of the Galleries and the works of art of Rome, is entrusted to the Roman Polyphonic Choir. In the years 1999-2000 the frescoes were restored, on the impulse of Emilio Acerna, by the Superintendency for Artistic and Historical Heritage of Rome.